It was finally the day I had literally been preparing for months. 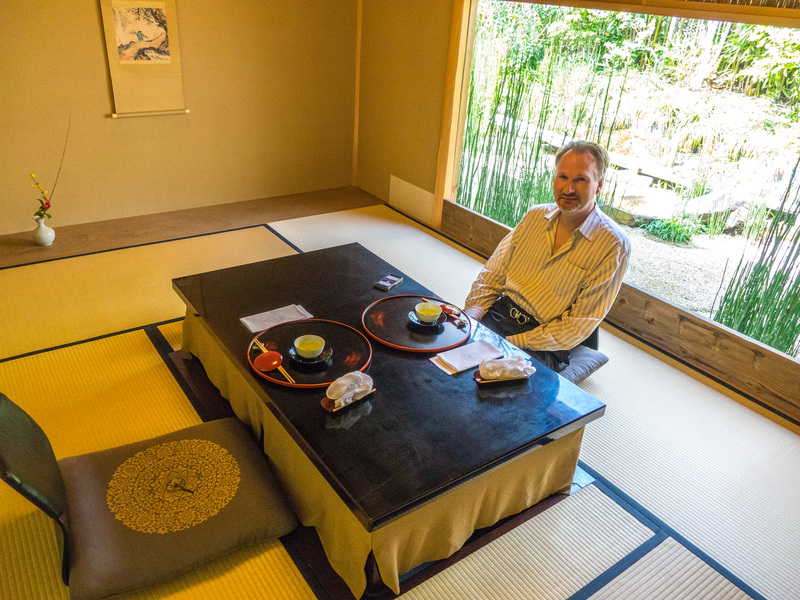 Through our machiya manager, I had been lucky enough to secure a reservation at the world famous Kikunoi restaurant for a multi-course meal known as a kaiseki. 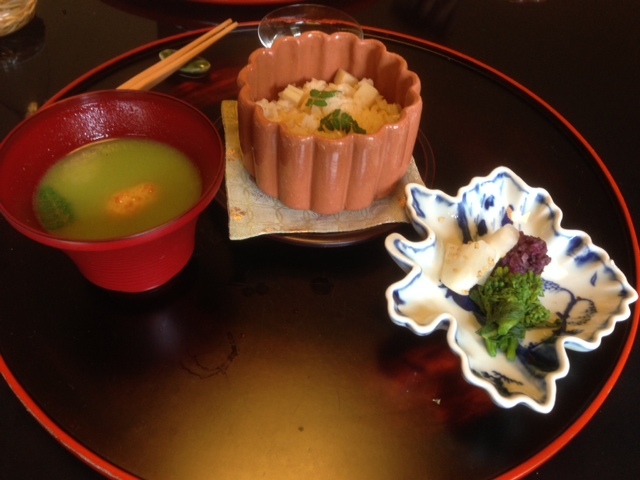 A favorite of top chefs around the globe, it is considered THE place for a true kaiseki experience. I had been warned in advance that we probably would have counter seating versus a private room but that wasn’t a big deal as we’d be closer to the master himself that way. It was a bit more cloudy as we took the 30 minute walk to the restaurant but seemed like more people than ever were snapping photos of the temples and shrines on the route. We went around a corner to a very traditional Japanese building and were greeted by an old man who instructed us to remove our shoes. 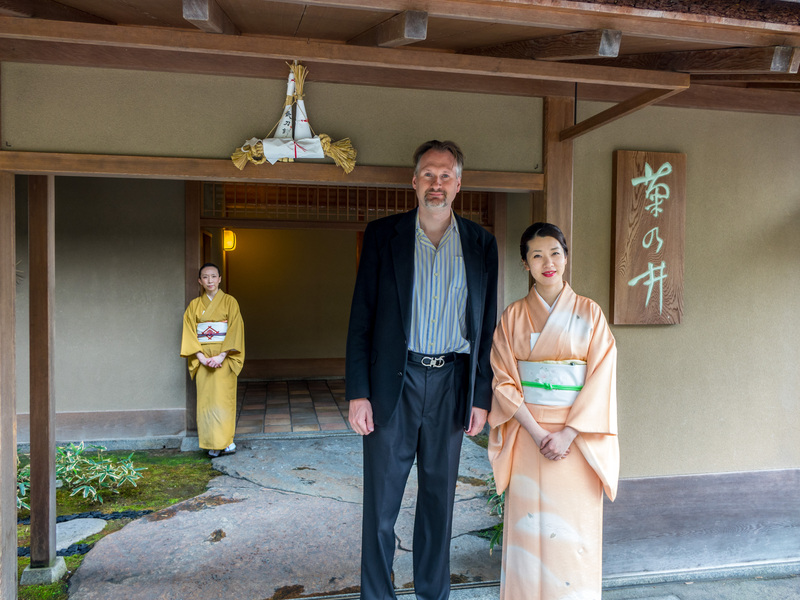 He was soon joined by a woman in a kimono who bowed and told us to follow her. We made our way through a maze like set of rooms and came to a private room facing a pretty courtyard. We had gotten one of the rooms after all. There was a low table with cushions and a support for the back. I actually knew the drill here and swung my legs underneath the table where there was a heated pit to rest our legs. Amazingly it fit! In front of us was a black round tray and a small flat bowl. Our server poured something into the bowl and explained that it was a welcome sake made with cherry blossoms. It was definitely different than a typical sake with a nice spice kick to it. We decided to get a 720ml bottle of sake for lunch and chose the less expensive of the two. I figured it would probably still be excellent, and it was – very light and refreshing but still with that unique punch sake can give you. The door opened and there was another woman in a kinomo who said in broken English that she was the chef’s daughter. 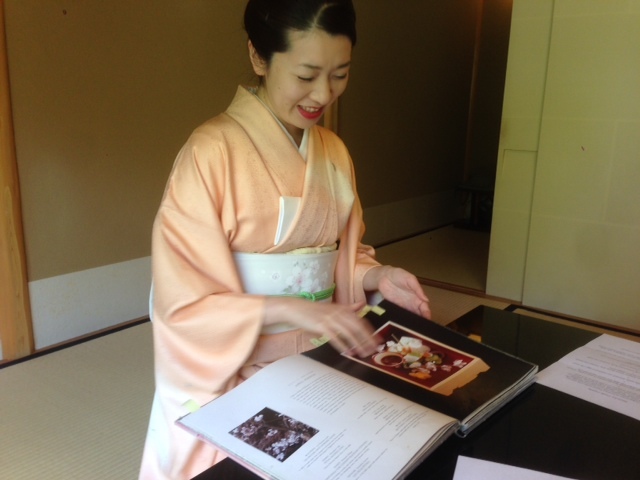 She presented us with the menu we would be having today and set down a book that explained the various dishes, which had been published a few years ago with a forward by Feran Adria. 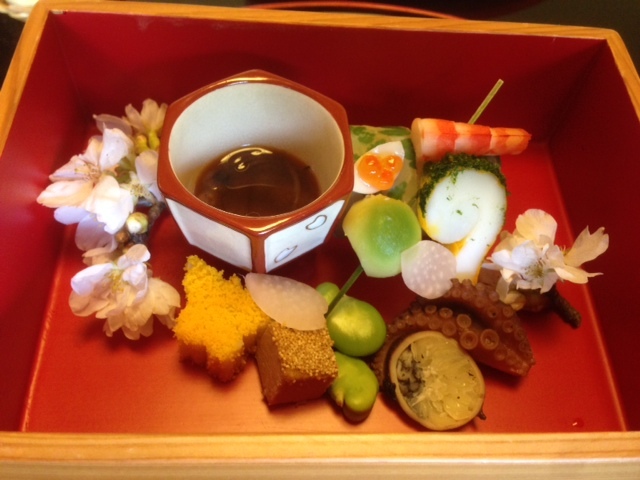 The first course soon arrived in a very beautiful wood carved box and inside was this true work of art. 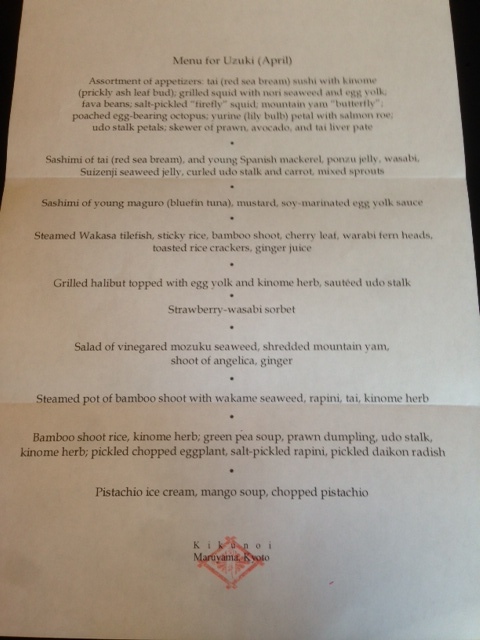 I won’t list each component as the full menu is above but everything was delicious. 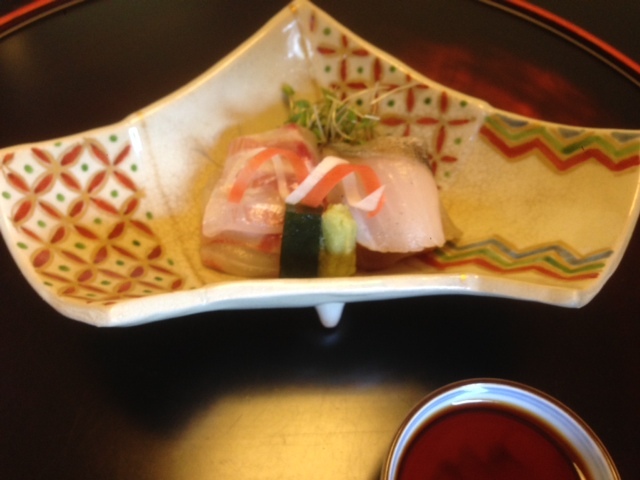 The true stars though were the red sea bream roll and the mountain yam shaped like a butterfly. So clean and pure. Soon after we finished, the next course came – ah, finally some sashimi – the red sea bream again along with some stunning Spanish mackerel. 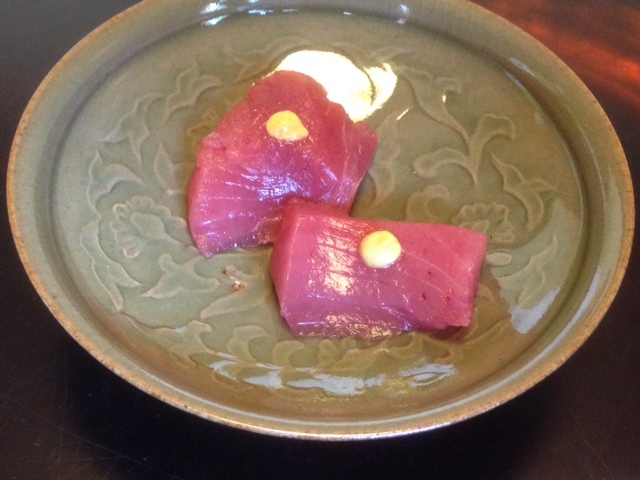 This was quickly followed by more sashimi and the biggest of them all – belly of blue fin tuna (maguro) with a piquant soy mustard sauce. Like buttah. 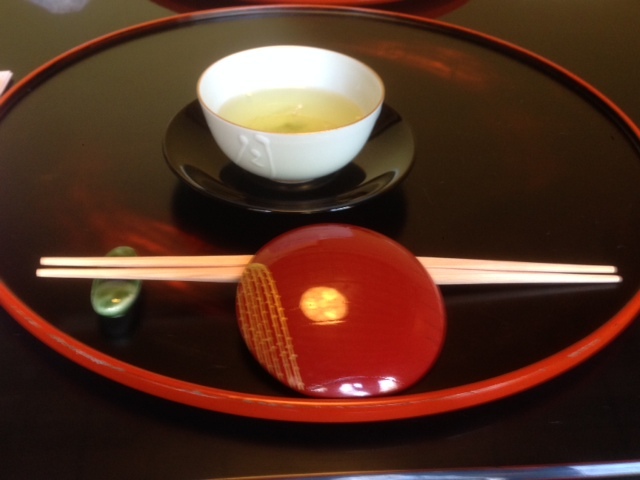 Next we switched to a hot course – tilefish steamed in cherry leaf with sticky rice. The fish was perfectly tender and the clumps of sticky rice made for a nice texture contrast. 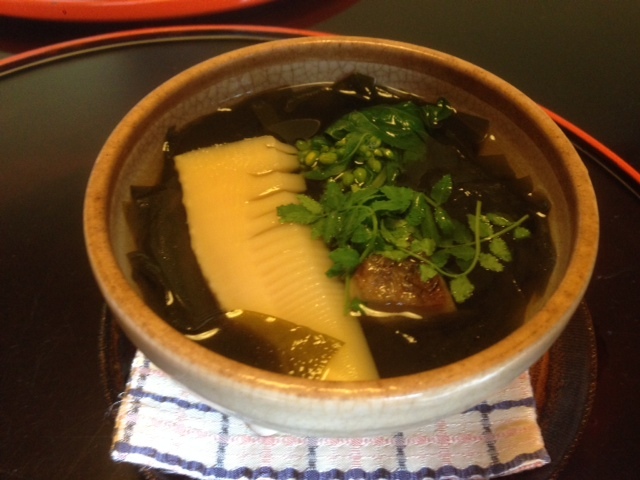 It was also the first time I had bamboo root, which tasted like a steamed potato with a bit more of a woody flavor. Delicious. 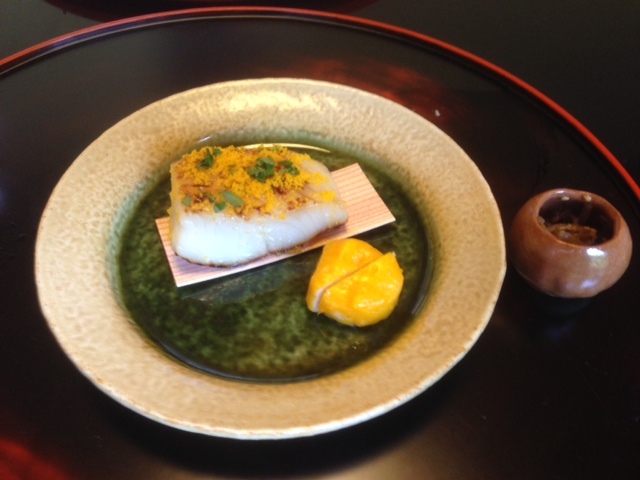 After some more sake and a chance to catch our breaths, my favorite course of the day arrived – grilled halibut with egg yolk. The yolk had been turned into a fine yellow powder scattered on top of the thick filet of halibut. The meat was thick but not chewy, with a slight hint of the charcoal from the grilling. 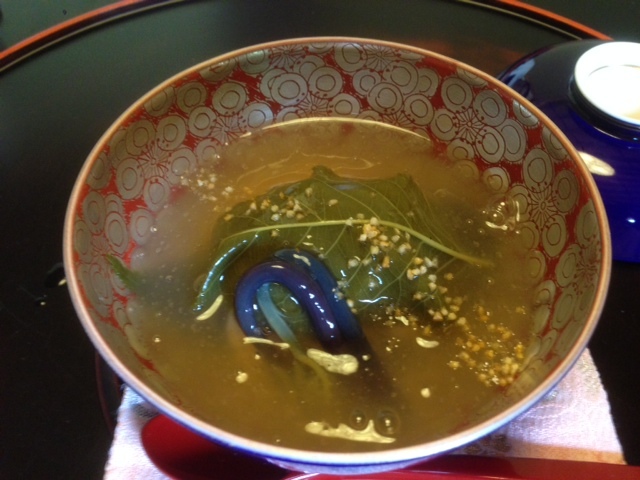 There was also a small bowl of a local plant called udo in a rich soy sauce. A truly stunning dish. 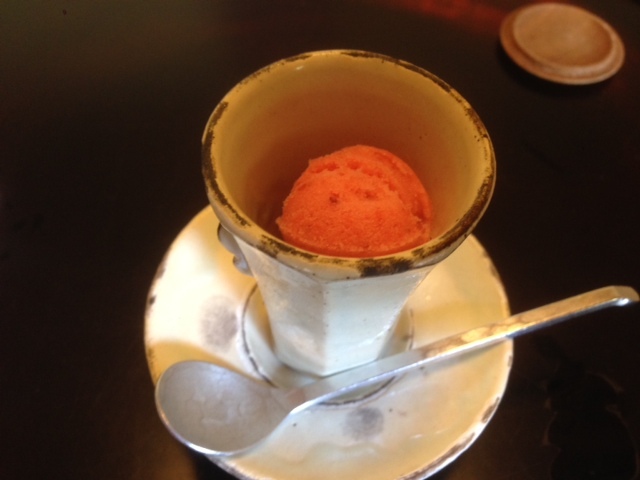 I had been looking forward to the palette cleanser since seeing it on the menu – strawberry-wasabi sorbet. As Chris correctly pointed out, it taste pretty much what you would think that combo would – the wasabi wasn’t overpowering but added an interesting element of heat. Our next course was the only real miss of the meal. A seaweed salad with shredded mountain yam. To me, it was a texture thing. I did enjoy the yam though so it wasn’t a total loss. 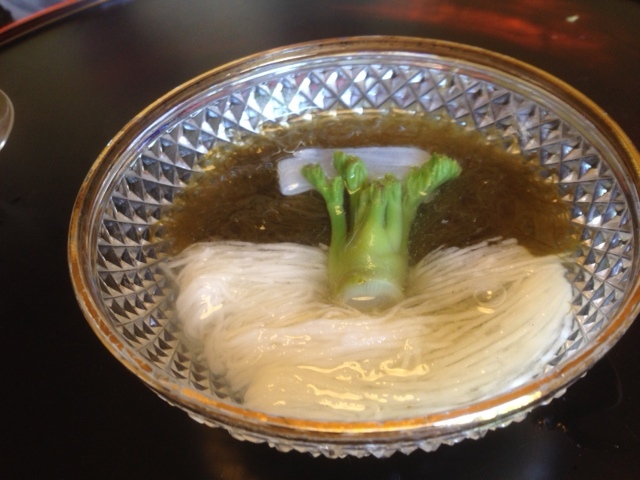 Fortunately the ship was righted with the next dish – a pot of steamed bamboo shoot, a different type of seaweed, our friend the red sea beam and rapini, which wasn’t something I was expecting to find. This was a much larger piece of bamboo, which tasted even better than the previous incarnation due to the rich broth that the sea bream helped develop. I also quite enjoyed the seaweed as it wasn’t nearly as slimy in this preparation. Our final savory course was another winner – see the full description above – but the highlights were the fantastic prawn dumpling, which was one of the best I’ve ever had and amazingly enough for me as I’m not usually a fan, the pea soup. I think I liked it because that’s where the dumpling was so the prawn flavor permeated the soup. By this point, I was pretty sated but since the last and only sweet course was my all time favorite ice cream – pistachio – along with a mango soup, I figured I could squeeze in a bit more. The ice cream was heavenly and while mango is pretty much my least favorite fruit, it complemented well with the pistachio flavor. We had actually only drank about a bit over half of our bottle of sake so our server kindly put the bottle not only in a bag but also wrapped it in bubble tape – full service indeed. We said our goodbyes and made our way to the exit, reveling in the amazing experience. Tonight would be time for more hanami fun but in the meantime, a much needed nap was in order. Posted on April 3, 2014 by reyalto. Bookmark the permalink.